In the previous post, I wrote about commodity price volatility and its implications for agricultural commodities. There is little at this time that points to anything but a continuing period of price volatility in commodities generally, and agricultural commodities in particular. There is a history of the sort of bearish currency economic environments we find ourselves in currently. They don’t typically end well for agriculture. Before Ben Bernanke and Alan Greenspan were empowered to engineer ‘rescues’ of the world’s financial system, there were other central bankers and government officials that similarly impacted global economies. A common theme in looking at historic periods of extreme commodity price volatility is that they occur during periods of high government spending and subsequent devaluations of currency through various policy decisions. In today’s monetary policy environment an example is the Federal Reserve’s purchase of U.S. government bonds. Further back in time, an example is the decision of the U.S. government to go off the gold standard in 1971. I’ll provide historical perspective using corn prices. Below is a chart of average corn prices received by farmers in the United States since 1866. While corn prices vary from year to year based on changes in supply and demand, you’ll notice that substantial changes, or permanent changes in price levels. have occurred rarely, and appear to be correlated with significant monetary policy changes. Click on the chart for a larger view. Between the Civil War and the First World War, corn prices traded largely between 30 and 60 cents/bushel. The dollar’s value was pegged to gold, as were the currencies of other major economies. This changed with the outbreak of war in 1914 in Europe. Indebtedness increased for countries involved in the conflict and government finances deteriorated as spending on the war grew beyond all expectations. The gold standard was abandoned by major economic powers, including the U.S., during the war. Inflation ensued and commodity prices increased, including agricultural commodities. Prices of outputs increased faster than inputs, with corn prices more than doubling to $1.45 per bushel in 1918. Farmers in the U.S. enjoyed a period of prosperity that came to be known later as the ‘Parity Pricing’ era. Farm groups would argue in later decades that government policies should aim to return farm prices to levels indexed to those during this time of farm prosperity. The major monetary issue after the war was how to return to the gold standard, in particular whether to return to prewar values. The U.S., England, and France each chose different paths (Germany its disastrous path also), but eventually each ended up defining their currencies in terms of gold. The U.S. returned to gold at the $20.67 parity from before the war. This move was particularly hard on farmers, as prices of grain and other farm products decreased faster than the cost of inputs. The average price for corn received by farmers fell from $1.44/bu in 1919 to $0.54/bu in 1920. A prosperous time in agriculture came quickly to an end, even while the rest of the U.S. economy quickly adjusted and went on to a decade-long period of growth. The Roosevelt administration didn’t abandon the gold standard, but did devalue the dollar relative to gold in 1934. 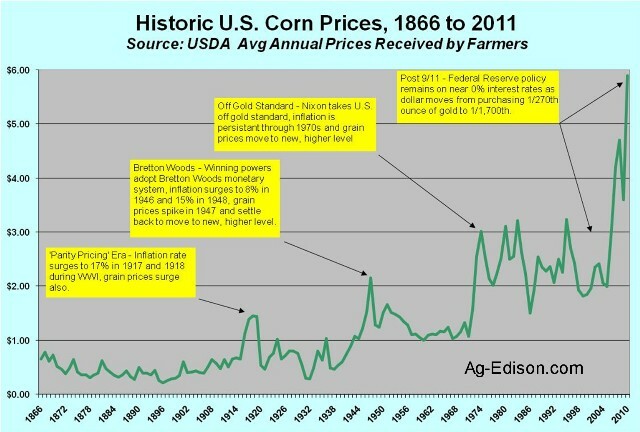 At the same time U.S. corn prices rose from $0.49 in 1933 to $.80 in 1934. It wasn’t until the end of World War II, however, that saw the next significant change in commodity prices. At the end of the War the U.S. and other winning powers adopted what became known as the Bretton Woods Agreement, a gold/dollar standard. Corn prices briefly rose to the $2/bushel level in 1947, but as adjustment to new dollar valuation settled in, corn prices moved into a range between $1.00 and $1.50 per bushel during the 1950s and 1960s. In 1971 the Nixon administration abandoned the gold standard of $35/oz. Government spending in the U.S. had risen rapidly since the mid 1960’s, a consequence of the Vietnam War and Great Society social program spending. This put pressure on the existing dollar valuation in terms of gold, and the era of floating currency values began. Corn prices, as well as other commodities like oil, rose in tandem with the decrease in the value of the dollar. In 1974, the rise in commodity prices coincided with a surge in corn exports, and the average bushel of corn sold in the U.S. went for $3.02/bushel. The U.S. suffered inflation through the rest of the 1970s, but new, higher trading ranges for commodity prices had been reached. Corn traded largely between $2 and $3 per bushel until around late 2006. What’s changed in terms of monetary policy in the last decade? Corn has traded in the last two years in a huge range, between $4 and $8 per bushel. Crude oil has traded largely above $80/barrel. The macroeconomic environment since 2000 (bursting of the tech bubble) and 2001 (September 11) has been one of near-zero interest rates. This has led to a weakening in the value of the dollar. Commodities are priced in dollars, so the lower the value of the dollar, the higher the price of commodities. In 2000, one dollar purchased 1/270th an ounce of gold and 28 pounds of corn. In December 2011, one dollar purchases 1/1,700th an ounce of gold and 9 pounds of corn. Some economists argue that dollar depreciation hasn’t been that severe and do so by noting the smaller changes in the value of the dollar relative to other currencies. I argue that most currencies have depreciated alike, with most governmental monetary authorities following similar cheap currency/loose money formula for the last period of years. Periods of high government spending are historically in tandem with periods of currency debasement. It takes many forms, but the idea is that governments have an incentive to pay back debts and/or fund continued spending in lower valued currency. Periods of war from history have the common thread of high government spending followed by currency manipulation and subsequent inflation. War and defense spending plays less of a role in government expenditures today, but social programs have driven government spending levels, as a proportion of GDP, to historically high levels along with government debt. The current situation in Europe mirrors historic instances where high government spending leads to a series of unpleasant choices with currency devaluation coming in line before austerity. The average price received by U.S. farmers for a bushel of corn in 2011 is pegged by the USDA at $5.90/bushel, an all-time high. Prices have backed off in the last several months, but is there any reason to expect prices to retreat significantly? It wouldn’t seem so, particularly during a week when the U.S. Federal Reserve agrees to provide dollar liquidity to European governments facing their own problems with unsustainable government spending. If anything, corn appears cheap compared to other commodities, gold for instance. Since 1980, it’s usually taken 100 to 200 bushels of corn to ‘buy’ an ounce of gold. Today, that number is at about 350. Perhaps gold it too high, but in the current environment, I think most spread traders would be long corn and short gold, betting on a narrowing of the spread. My biggest concern related to macroeconomics and agriculture is related to my earlier assertion that these sort of events don’t typically end well for agriculture. Periods of currency devaluation result in asset and commodity price inflation. The front end of these times can often be positive for agriculture, particularly for producers, as prices rise faster than costs. The back end of these times echo back to the 1920s, late 1940s, and early 1980s, not good times for agricultural producers. In 2007 I had an agribusiness executive who was nearing retirement tell me this was the third promised ‘golden era’ of agriculture in his career. The first in the 1970s, the second (very brief) in 1995, and now the third. A combination of market reactions and political changes can eventually change the macroeconomic environment that shifts the prices by which we buy, sell, and invest in unexpected directions and magnitudes. A significant shift in macroeconomics promises a significant shift in the agricultural business environment as well.